Now that strawberry season is upon us, I can't resist making anything and everything with the beautiful red berry!. We have been growing rhubarb in our garden ever since I can remember, and nothing beats the sweet/tart combination of strawberry and rhubarb. These muffins are slightly sweet and a little tangy. The streusel topping adds great texture and a little extra sweetness. The muffin base is based on Nigella Lawson's blueberry muffin recipe. These muffins are moist, they hold their shape nicely, and they also freeze really well. Slather these babies with some sweet cream butter, some strawberry jam, or just eat them plain. They are delicious hot or room temperature! Bring them to a friend in need or make them for a delicious breakfast in bed. Line a muffin tin with paper baking cups. Preheat the oven to 400 F.
Melt butter for muffin base, set aside to cool. Combine all of the streusel ingredients together in a small bowl and set aside. Combine cooled, melted butter with sour cream, whole milk, and egg in a large measuring cup. Beat until completely combined. Blend flour, baking powder, sugar, and salt in a mixing bowl. Stir until well-combined. Gently fold the wet mixture into the dry mixture. Be really careful to not over mix. Just make sure there aren't any dry ingredients left in the bowl. Then gently fold in the chopped strawberries and rhubarb. Use a small ice cream scoop or rubber spatula to scoop the batter into the paper lined muffin tins, fill to about 3/4 of the way full. 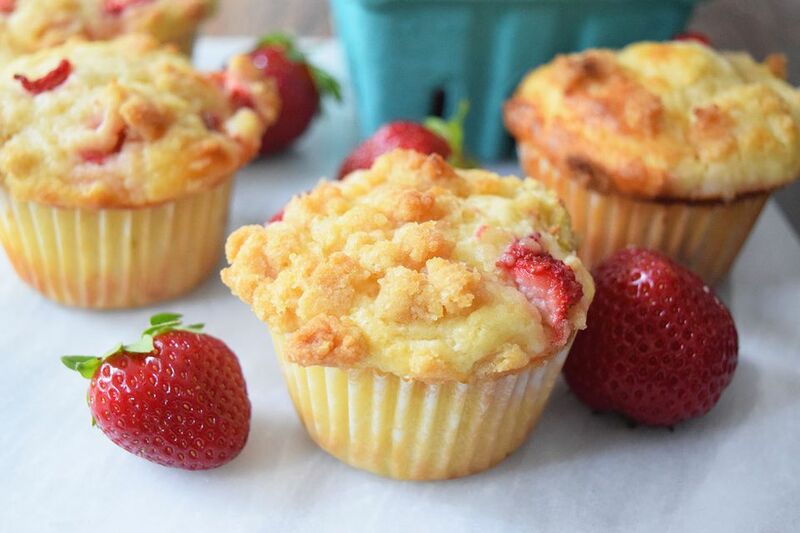 Top each muffin with about a tablespoon of the streusel topping. Bake in the oven for about 20 minutes, or until a toothpick inserted into the center comes out clean. To make the muffins ahead of time, just let them cool completely (this part is very important), place them in a large plastic bag and pop them in the freezer. Simply thaw them when you are ready to serve! They maintain their moist texture and flavor when freezing them this way and actually keep much better than storing them on the counter.